City Council Adopts an Ordinance Outlawing the Sport. The Ordinance Applies to Small Boys and Big Men. He Declares Football Is Too Brutal for This Clime—Council Adopts Ordinance Quickly. The general council of Atlanta has stolen a march on the Georgia legislature and has won the distinction of enacting the first anti-football law. Sad news to the school boys, but true. The decree has gone forth that no more games shall be played within the limits of the capital city. The days of football in Atlanta are gone. No longer will the boys meet on the gridiron to test their strength and skill and powers of endurance. This applies to footballists of all colors, ages and degrees: amateurs, professionals and plain footballists; all are on the same footing. 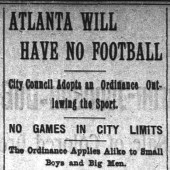 Yesterday Atlanta’s city fathers arose with almost one accord and with one swoop wiped football from the list of sports which can be indulged in the city. There was a brief struggle, weakening opposition, and then the deed was done; the ordinance was passed and now goes to the mayor for sanction before becoming effective. “Be it ordained by the mayor and general council of Atlanta that from and after the passage of this ordinance, it shall be unlawful for any person or persons to engage in or play the game of football within the city limits of Atlanta, or on any territory incorporated for police purposes. Mr. Woodward said the time had come when football should be suppressed. “The game of football is entirely too brutal for this day of enlightenment and progress,” said Mr. Woodward. “It is a game in which the powers of endurance of the players are tested, often to the injury of the members of the teams. Players are hurt in nearly every game that is played, and many have been seriously injured or killed. Councilman Peters Has a Question. Councilman Peters is a young man, and he did not take kindly to the football ordinance. He used to play the game, and it occurred to him that the ordinance was a little broad in its provisions. “Will this ordinance prevent the school boys from playing football?” asked Mr. Peters. A motion was made to refer the ordinance to the ordinance committee, but the council members voted it down, and they then adopted the ordinance. So, football in Atlanta is ended; long hair and other paraphernalia will now be sent to the junk pile. Football yells will no longer drive the nervous population to distraction, and peace will reign in the land. 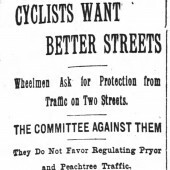 Wheelmen Ask for Protection from Traffic on Two Streets. The Cyclists of the City Are Beginning To Talk About Wheel Tracks and Better Roadway Improvements. The bicyclists of the city will not be given exclusive rights on Peachtree and Pryor streets during certain hours of the evening. 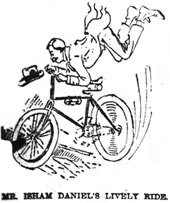 The ordinance committee of the council will make an adverse report on an ordinance turning the streets over to the cyclists during the hours from 4 to 8 o’clock p. m.
The proposed ordinance was designed to prohibit traffic of all kinds on the streets; leaving the roadways clear for the wheelmen. The matter came up on a petition signed by a number of cyclists of the city and when it was presented to the council the paper was referred to the ordinance committee. Chairman Colvin, of that committee, caused an ordinance to be drawn up on the line of the petition so that the matter could be properly acted upon. Yesterday afternoon the committee was called together and after considerable discussion it was decided to report the ordinance to the council with an unfavorable recommendation. There is said to be a good deal of opposition to the project and it seems as if the question will fail of adoption. While there are some councilmen who do not think the streets can be regulated in favor of the cyclists, still there is a growing sentiment in favor of providing better roadways for the popular mode of travel by many people. The cyclists say that the streets are in bad condition in many places and it will be no surprise to many at an early date to see the wheelmen of the city among those to urge the necessity of street improvements and the laying of such paving as is best for the riders. In many cities of the country the wheelmen have taken a prominent part in the matter of public improvement legislation and in many places they have succeeded in persuading towns and cities to provide roadways where they formerly had none. The rapid increase in the number of cyclists is argued by them to justify their demand that the authorities begin to consider the question of better roadways. In some cities tracks and speedways are being constructed as a result of the agitation of the wheelmen. 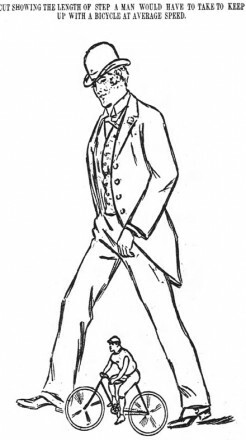 It is said that the Atlanta wheelmen are vigorously opposed to the laying of any more belgian blocks on the principal thoroughfares and that they favor asphalt or brick pavement, making the roadways suitable for good riding. Of course, the number of wheelmen is as yet comparatively small as compared with the whole population, but as the riders increase so does the demand for better streets. The cyclists say that they are part of the public and that the growing popularity of wheel transit should cause the city authorities to look after their interests more than has been done in the past. Peachtree and Pryor streets are, of course, two popular thoroughfares for the wheelmen, because those streets are asphalted in the case of the first and paved with smooth vitrified brick in the second instance. Every afternoon and early evening there can be seen scores of riders, male and female, spinning along at the top speed, exercising after the day’s work or out for a breath of fresh air. These streets are so popular among the riders that they determined to ask the council for better protection and the matter will be brought up Monday on the report of the ordinance committee agreed to yesterday. Nearly Everybody, Young and Old, Rich and Poor, Is Riding Nowadays. When Atlanta’s first big exposition was in progress fifteen years ago a spinster school teacher, tall and slender and elderly, was “seeing the sights” with her sister. She came from a little settlement hidden away in the mountains of Rabun county, and it was her first visit to a big city. The cotton exposition contained many marvels which excited her wonder, and she frequently expressed her surprise in the crude parlance of a mountaineer. The good lady, if she is still alive, would see about 1,200 wheels “running away” with men and women, too, if she would pay Atlanta a visit today. The growth of the bicycle “craze,” as some people insist on calling it, has been very healthy and fairly rapid in this city of late. From December 1st there have been nearly 500 new wheels sold in Atlanta. Of this number 400 are being ridden daily by Atlanta people. There are 1,200 wheels in daily use here, which is clear evidence that bicycling is beginning to be appreciated as a healthy and enjoyable sport. Those who think that Atlanta is leading in this innovation, however, are mistaken. Atlanta is not so far behind other cities on the bicycle question as to be ashamed of her position, but she is by no means leading the van, not even in the south. Savannah, St. Augustine and New Orleans have become thoroughly imbued with the bicycle fever, and in proportion to population they are slightly ahead of Atlanta. If Atlanta had as many bicycles in proportion to population as Washington, New York, Boston and Chicago there would be in the neighborhood of 10,000 wheels instead of 1,200. A bicycle salesman, one who is thoroughly posted on the bicycle situation in every city in America, said yesterday that he believed the bicycle business in Atlanta was more promising today than ever. Peachtree street is the wheelman’s delight. Pryor street is satisfying to the most fastidious. Aside from these two thoroughfares Atlanta is deficient in bicycle paths, but the suburban roads afford excellent riding. Those who have ridden long enough to become inured to a good, long tour, find a spin out to Lithia Springs or Stone Mountain enjoyable. The roadways through and around Inman Park are good. The trip to Buckhead makes a pleasing run of fourteen miles. One of the favorite bicycle paths is along the old Peachtree road and great things are expected of the road to the barracks if the government will pass the appropriation for improving it. At present there are no large bicycle clubs here. Small parties can be seen every morning and evening when the heat of the sun is not oppressive, spinning away to the suburbs. Tourist parties from northern and eastern cities often rent wheels for an afternoon to take a better look at the Gate City and its surroundings. It is said that preliminary steps are being taken to organize a very large club of local wheelmen who will take regular tours every evening. This has been done in nearly all of the larger cities. In New York the policemen who are stationed along th Boulevard are provided with bicycles for the purpose of arresting wheelmen who go faster than the law allows. 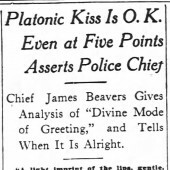 The great bicycle path from Brooklyn to Coney Island, which is said to be the finest in the world, is always patrolled by policemen in knickerbockers, who can “scorch” most of the racers when it is necessary to make an arrest. In case they cannot catch a fast racer their shrill whistle causes the policeman ahead of him to mount his wheel and when Mr. Scorcher has distanced his first follower he finds himself in the clutches of the second or third, as the case may be. It is impossible to escape and yet is surprising how many bold wheelmen will attempt it. There are at least a dozen such captures on the Brooklyn bicycle path every Sunday. The ladies of Atlanta are the great enemies of the scorchers. They have begun a crusade to have the habit stopped and they are firm in their determination. The chances for a bicycle squad for the Atlanta police force are good. In case the city council passes an ordinance restricting the speed on Peachtree street it will be necessary to mount the policemen who patrol that thoroughfare on bicycles in order to prevent violations of the ordinance. Where Beginners Learn To Ride. The management of the school says that the ladies learn very much more easily than the men. They are less awkward. The ladies’ classes are from 8 a. m. to 1 p. m. and 2 p. m. to 6 p. m. The ladies are also given what are known as direct lessons. When they reach a certain point in advancement and gain a little confidence they are put in charge of an instructor and taught on the street. There are many expert graduates of the school among the lady riders of the city. Major Fitten a Graceful Wheelman. Major John A. Fitten is one of the city’s graceful wheelmen. This is true despite the major’s 265 pounds. He flits about with ease, notwithstanding that he is a heavy weight. He learned at the wheeling school in the Grand. It took him some time, but he learned thoroughly. His school days were attended with many hard knocks and falls, but he pulled through without any broken limbs. He is now having a huge wheel of stout frame specially manufactured for himself and in a short time he will be spinning over the city’s by-paths on his trusty charger. Major Fitten took his lessons at the school at the early hour of 6 o’clock in the morning. Rosy from a good night’s sleep he would hie himself to the school. He would mount the wheel with the courage of a Spartan and proceed to land himself violently upon the floor some twenty feet from the starting point. Nothing discouraged, he would spring to his feet nimbly, scurry upon his vehicle and hurry away again. He had a great rival in the person of Colonel Thornton, who also tips the scales at 265 pounds. They took lessons together and had many an exciting encounter. Their antics were the talk of the school and every pupil felt a deep personal interest in the outcome of their studies. They both graduated about the same time are now vieing with each other in the ease and grace with which they spin across the country. Jim McKeldin is one of the city’s enthusiasts. He has been riding a beautiful $125 wheel of which he is immensely proud. He was out on the asphalt with a party a few nights ago and met Major Fitten. “You don’t know the first thing about riding,” said the major scornfully. “I don’t, eh?” said Mr. McKeldin; “suppose you try it.” He hopped off his wheel. “Here, get up, major, and give us a lesson,” he said. The major held back modestly. “Oh come on,” said Mr. McKeldin. “Well, here goes,” said the major, and he made a leap for the saddle. The wheel shot gracefully forward. The pedals responded easily to the major’s expert touch. He went sailing down the asphalt as graceful as a fairy. 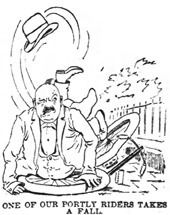 There was a sudden crash, and looking, Mr. McKeldin saw his wheel sink into utter ruin and collapse beneath the major’s portly form. It was not an ordinary collapse. It was an extraordinary one. The wheel did not simply break in part. It broke all to pieces, into hundreds of pieces. The seat was mashed as flat as one of Aunt Jemima’s pancakes, and the wires of the wheels were twisted into a million shapes. It was hard to tell whether it was the remains of a bicycle or a dynamo. There was no semblance of a wheel left. Although Mr. Isham Daniel has laid strict injunction upon his companion not to repeat the story, it has gained general currency and I will repeat it here-the story of Isham Daniel’s swift and disastrous ride. He took to the wheel gingerly. He did not enter into it with that conquer in-a-minute-or-die spirit. He was patient. He lacked confidence, and he wanted room. He did not like to ride on a street on which there were any other moving objects, and he always avoided cars. Cars were his pet fear. He went out with Jim McKeldin the other afternoon late. He paced along carefully until Wilson avenue was reached. It’s a fine drop for the wheelmen down Wilson avenue to the expostion gate. “Go it, Isham, I’ll follow,” said McKeldin. Mr. Daniel moved forward slowly at first, his wheel gaining in celerity as he went. Presently it was moving at furious speed and the rider found his feet off the pedals and himself unable to regain control of the mad steed. At this juncture a car loomed into view, coming toward him in front. He knew for a certainty that collision with that car was inevitable. The thirty feet of space that he had on his side of the track was far too narrow to allow him to pass in safety. There was but one thing to do; he would dash into the sidewalk. It was a startling spectacle that Mr. McKeldin looked down upon. He saw his comrade swerve violently to the right and with the force of a steam engine dash into the high curbing. 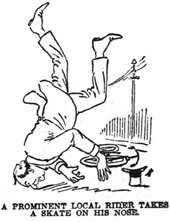 The wheel stopped with a crash and was dashed to pieces, and the force of the collision lifted Mr. Daniel from his seat and planted him over in the vacant lot. He got up unhurt, glad to sacrifice a wheel as the price of his own life. Mr. Thomas C. Erwin is also a victim of the freaks of the wheel. He was hurled from his, near Fort McPherson, last Sunday, and skated along the road on his face for a considerable distance. The experience was very damaging to the smooth contour of his face. And there are others who are wearing bandages, poultices and plaster casts. The percentage of accidents is naturally high, considering the large number or riders there are in Atlanta. None of the sufferers from the wheel have given up, however. They are waiting to get well, when they will ride again. The General Council Closes Barber Shops. There will be no more shaving and hair cutting in Atlanta on Sunday. The general council has so decreed it. During the regular session of the body yesterday afternoon Mr. Cooper, chairman of the ordinance committee, presented an ordinance prohibiting barbers from keeping open doors on the Sabbath day or working behind closed doors. The ordinance was drawn by Mr.Cooper in accordance with a petition from the Atlanta barbers. 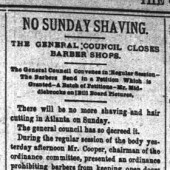 That petition was signed by sixty-six of seventy odd barbers in Atlanta, and urgently requested the general council to pass an ordinance prohibiting barbers from working on Sunday. The ordinance created a warm discussion. Mr. Van Winkle opening the fight. Mr. Van Winkle wears side whiskers and when the lather is applied to his face the razor covers only the small surface of a chin. 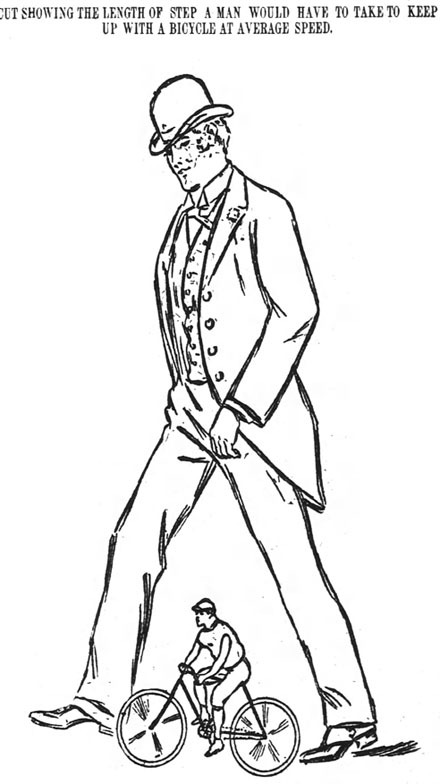 Mr. Van Winkle has but little use for the tonsorial artist, but he was opposed to the ordinance. He thought that a man ought to have a shave when he felt inclined to invest fifteen cents in the luxury. EVERYONE WILL AGREE WITH ME. “You don’t need a barber at all. That beard of yours shows that,” said Mr. Van Winkle, smiling. The entire council laughed and Mayor Hilyer joined in. The motion to table the ordinance was lost. Mr. Bill Mickleberry, the beardless, was not there to vote. Mr. Mahoney, who wears no beard, and Mr. Middlebrooks, whose blushes can’t be seen on account of a heavy beard, took not part in the debate. Mr. Stockdell and Mr. Hutchinson were absent, but both are regular Sunday patrons of barber shops. Mr. Mahoney, of the street committee, offered a resolution, directing the contractors putting down belgian block on Decatur to sink crossing at the intersection of the streets. Mr. Beatie opposed the resolution vehemently. He said among other things that a street paved with belgian block had no more right to the crossings than a brass monkey had for a new shirt. Mr. McAfee supported the resolution. So did Mr. Cooper, who claimed that the general council had nothing to do with the work, but that it was a matter in the hands of the street commission. The mayor differed with Mr. Cooper. near Broad. The reports recommended that the saloons be given a license until August 1st, and that after that no license issued. One of these saloons is run by a widow lady, a Mrs. Mangum. Mr. Robert Hill appeared before the council and argued against the report. Mr. McAfee through the committee had right to debar a person from applying for a license hereafter. He made several ineffectual efforts to have the report amended. Mr. May coincided with Mr. McAfee. 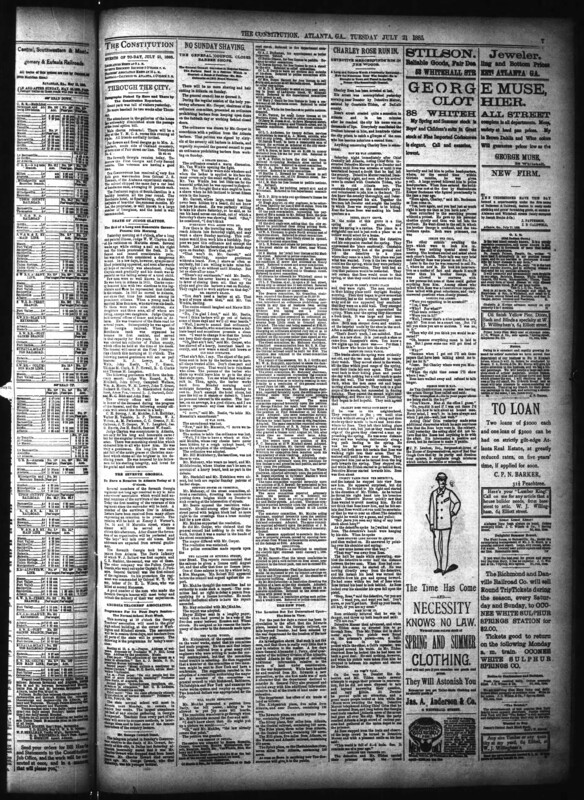 Mayor Hillyer sent in a lengthy paper, which when read proved to be a veto of the five-feet sewer between Houston and Wheat streets. He assigned as his reasons the inadequacy of the sewer to the demands made upon it. Mr. Kirkpatrick, of the special committee on the water works, stated that his committee had made progress. He then said that letters had been received from a great many civil engineers who were willing to make the survey contemplated, but that the committee found trouble in selecting. He then suggested that a member of the committee or two members might be sent to New York and have a conference. The suggestion resulted in the adoption of a resolution authorizing the mayor and a member of the committee on general council to visit Richmond, Baltimore, Philadelphia and New York and examine the water works system and employ an engineer. Two hundred dollars was appropriated for the trip. Mr. McAfee presented a petition from Darly, the bill poster, asking to be allowed to put up some bill boards.